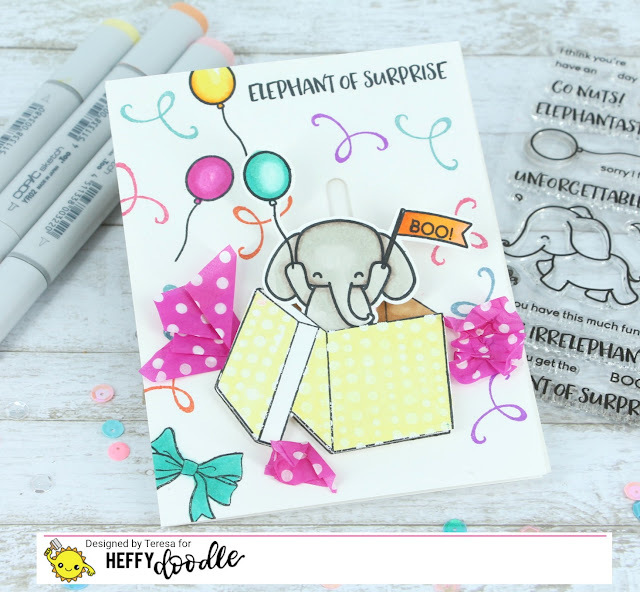 I am tickled pink to be doing a guest design post for Heffy Doodle Stamps! 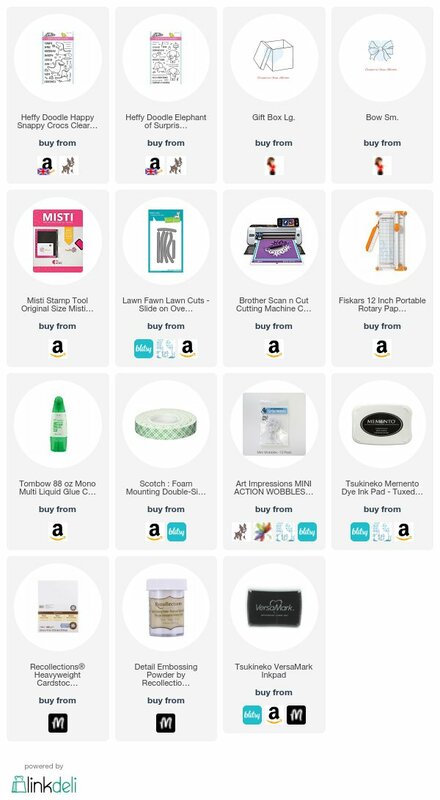 Please do check out my post here. Today I have a fun interactive card that both slides and wobbles using the Elephant of Surprise stamp set and the Happy Snappy Crocs set. 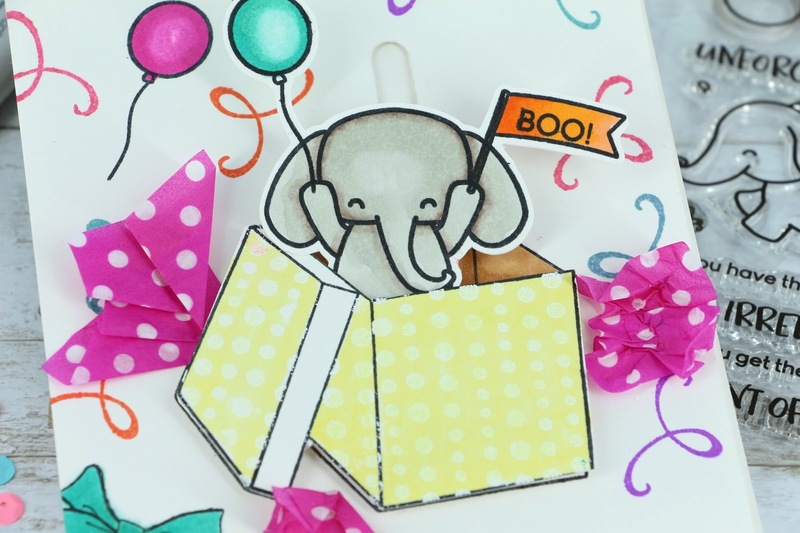 On a separate piece of cardstock I stamped the elephant, the flag, a balloon and the word "boo" on the flag to create a composite image from the Elephant of Surprise set. After coloring it with Copic markers, I used my Brother Scan n Cut to cut it out and set it aside. I stamped random "swirls" with a small stamp from my stash in different bright colors to make the background even more festive and added the sentiment "Elephant of Surprise" at the top right hand corner. I tried an experiment with the slider - I used a small *action wobbler in the channel since it has a wide base and top and it seemed to work fine although it doesn't slide quite as easily. I added two layers of foam tape on the card front to leave space for the slider to move once adhered to a standard A2 sized card base. Next I glued the elephant piece to the wobbler (which was already placed into the channel) and last added the box "front" with a double layer of foam tape. Next I removed the strips from the *foam tape and adhered to an A2 sized card base. 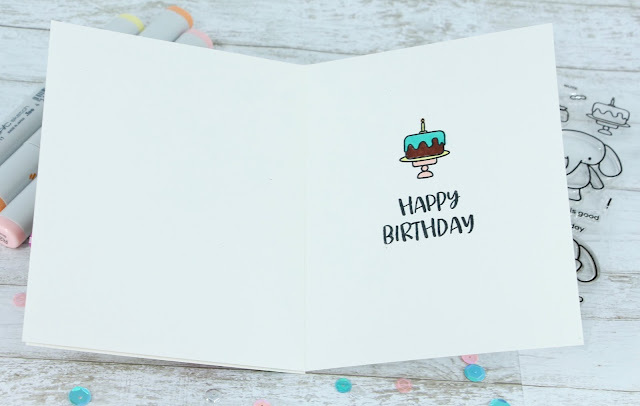 I also decorated the inside of the card with the small cake stamp from the Elephant of Surprise set and Happy Birthday sentiment from the Happy Snappy Crocs stamp set. Thanks so much for stopping by today and taking a peek at this card. I would love to know what you think and look forward to seeing your comments!